Okay. So you'll see in a moment that I "borrowed" from the title of an incredible article (with accompanying video) that you must read if you raise or serve teens. As a parent in the midst of raising two teenage daughters, I've had a lot of time to reflect on their behavior and that of their friends. (I've also had many years to reflect on my own behavior during those years.) I'm pretty lucky to have daughters who, for the most part, have behaved about as maturely as a parent could hope for. Nevertheless, they've done some really bizarre things. And the explanations they sometimes provide for their behavior often leave me wondering whether they'll ever figure out certain things. You've undoubtedly had this experience as well if you serve teens, especially those who have entered your organization's door because of destructive behavior. Let's face it. When teens are in the throes of a crisis, we can hope they figure it out, but we really don't know whether they will. A common focus of discussion about the teen years involves whether the behavior we see in teens is primarily or exclusively related to modern adolescence--a cultural construct of the modern age--or whether there is, in fact, a biological basis for their behavior. As an anthropologist, I'm confident in saying that it's a bit of both. The fact that we no longer ask children to move quickly--almost instantaneously--from childhood to adulthood, for example, has created a excruciatingly long period of time in which it is acceptable for teens to act like, well, teens and not young adults. As an observer of culture's impact on human behavior, I have come to understand that teens' behavior is a consequence of the influence of their environment (culture) and biology, not one or the other. Moreover, the influence of the environment teens experienced as children (e.g. if they were abused or severely neglected) can act upon their biology (e.g. brain chemistry). But that's a subject for another post. Given that we can't entirely blame the environment (e.g. parenting) for teen behavior, the question is how much we can attribute teen behavior to biology. Quite a bit as it turns out. Enter Robert Sapolosky. Dr. Sapolsky is a professor of biology, neurology, and neurosurgery at Stanford University. He's one of the preeminent researchers on the brains of primates and humans. According to Dr. Sapolosky (I love this quote), "The adolescent brain is not merely an adult brain that is half-cooked, or a child’s brain left unrefrigerated for too long." The brain enters a distinct developmental stage that has an evolutionary basis. 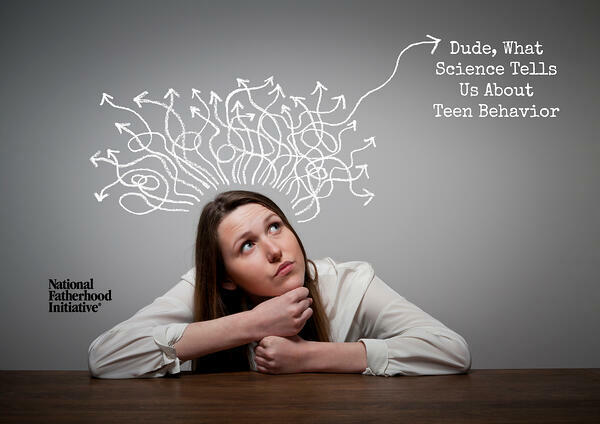 Sapolskly explains, for example, how and why the teen brain reacts differently than the adult brain to the same expectations of rewards. I encourage you to read Dr. Sapolsky's article "Dude, Where's my Frontal Cortex?" in the latest issue of the online publication Nautilus. You can find accompanying video here. After reading the article, I came to the conclusion that culture might have caught up with biology in terms of creating a social stage of development that follows the brain's trajectory. This knowledge doesn't change the challenge for parents of teens and those who serve teens. It makes us only a little more knowledgeable. The challenge remains helping teens navigate a time in their lives that is full of excitement, experimentation, and danger. Do you serve teens or teen parents? If so, check out our latest program additions Relationship Smarts Plus and Love Notes! These evidence-based programs are ideal for helping teens and teen parents navigate relationships, perhaps the most significant issue they face during adolescence, especially when they're already parents.